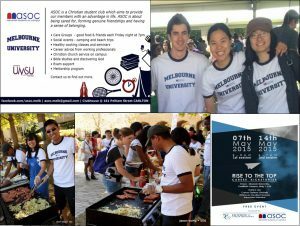 Gateway support the Adventist Students on Campus (ASOC) clubs and have campus ministry presence at University of Melbourne, Monash University and Victoria University. You will also find ASOC Clubs at Latrobe University, Macquarie University, Adelaide University, NSW University and Newcastle University. Fun — Meet real friends in an authentic environment of friendship and care. We run camps, boat trips, hiking, hot pot nights and many fun activities. Care — Be enriched. Our student small groups that meets each Friday night is called care group. It is UniQUE group. ‘Uni’ as a group to support young people at university / college age. Q for Quality Time, U for Useful Skills and E for Essential knowledge. We meet every Friday night on campus. Contact us for details. Mentoring — Harvest provides mentoring for university / college age young people by having working young adults mentoring students. Learn about Biblical discipleship and how mentoring will change your life. English Language — Having a hard time to improve your spoken English? We have English class run by native speakers to help you!